7 bedroom house (sleeps 14) in Abersoch, North Wales - ideal for beach. A large 7 bedroomed three storey, semi detached house with stunning sea views in Abersoch village. Located in the picturesque and lively North Wales town of Abersoch. The house is centrally located, 1 minute walk from the village centre and 5 minutes from the beach, yacht club and golf club. 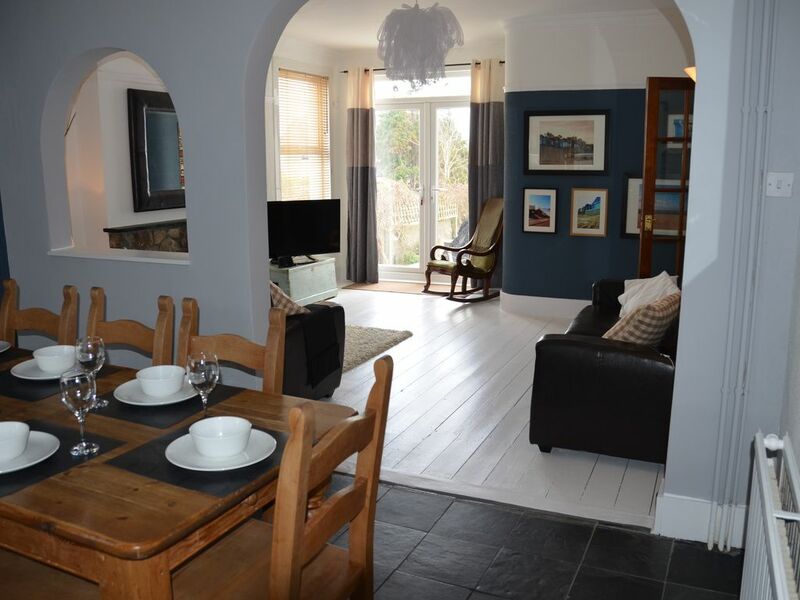 The house is self catering and comfortably sleeps up to 14 people, it is available as a holiday rental all year round. Linen /Towels: Unfortunately linen and towels are not provided. All beds have duvets and pillows, hence require bed sheets, duvet covers and pillow cases. Double room (x 3) require double bed sheets and king duvet covers. Singles (x 8) are all single linen. Also, there is no cot provided - we find guests prefer to bring their own. We are the Cox Family from Cheshire, 4 brothers who have holidayed in Abersoch all our lives (we even lived there for a couple of years). We bought Island View as a family project and holiday house in 2007 and have been trying to make this lovely big house better each year! We loved the size (we're a big family), the location (close to everything), the views (without the Million Pound price tag) and the period nature of the house. We don't think much comes close to the size, location and value of Island View....we hope you agree. LPG Gas Central Heating to ground and 1st floor. Electric wall heaters to 2nd floor. Electric 'wood burners' in both living room and lounge fire places. Golf is available 500 yards away at Abersoch Golf Club, or there are clubs at Nefyn and Pwlheli. Bedding Hire available via Colette of Pressgang in Pwllheli. If you would like bedding and towels to be provided, and beds made (and stripped after your departure), please contact Colette by email (colettenotley@yahoo.co.uk) or mobile (07745 399902) - min 2 weeks notice required. The cost for the whole house, all beds and towels is in the region of £210. We had a great time over Xmas. The house is in a perfect location. Disappointing that no linen or towels are provided especially with the amount we had to bring from home to cater for our stay Linen could be provided but at a very expensive cost. Lovely house but upstairs is a little tired. Thank you for your review, delighted you had a great time. We will be using a new changeover service for 2019 which will include linen for new bookings, and this is on the back of some significant redevelopment of the house over the 1st quarter of 2019 - more details to follow soon. We have really enjoyed staying in this house in Abersoch, it has been ideal for our anniversary celebration with our extended family including four children. It was plenty big enough for twelve of us with room to spare. The main dining table could just about squeeze all of us round but a larger party could use the table in the adjoining room. This room was great for the children to use for drawing and playing lego etc. The kitchen has a huge fridge/freezer and catering size cooker so perfect for a large gathering. The house is in a good position - a few minutes walk to the main town and about 10 minutes walk to the beach with the children. The beach is great - sandy & safe for swimming. We would definitely use this property again. Huge house, parking down the side for a few cars, great living space, nice BBQ, very close to town and beach. The house was excellent and we all enjoyed our stay there. The kitchen had every utensil under the sun and was large enough for us not to be tripping over each other when making sandwiches etc. The lounges and dining area seated our group quite comfortably and the tables in the garden were great for having breakfast in the morning sun. Plenty of bathroom options, shavers be warned you need to bring a mirror. The house is in a great location, near to pubs, restaurants, supermarket and just a couple of minutes’ walk from the beach. A great base for touring the Llyn peninsula or like us, walking the coastal path. We all really loved it and hope to return again sometime. The picturesque village of Abersoch, near Pwllheli in North Wales is ideally located for all of the beaches in the Llyn Peninsula (Abersoch, Llanbedrog, Hells Mouth, Aberdaron) or the mountain pursuits of Snowdonia. There are numerous attractions in the local area, from all types of watersports (sailing, waterskiing, surfing, kite surfing), to stunning golf courses (at Abersoch, Pwllheli and Nefyn). To a multitude of country pursuits including horse riding, walking, shooting and fishing. The nearest town, Pwllheli, has a marina, supermarkets, funfair, go karting and leisure centre - plus a weekly market. Slightly further are the North Wales castles of historic Criccieth, Caernarfon, Harlech and Conwy. £400 Security Deposit required - to be returned within 10 days, subject to property checkout. Reservation deposit of 25% required to secure rental. Full payment (plus security deposit) due 6 weeks before rental.